18 februari 2010: Nou we weten iets meer. Het thema voor dit jaar is Many Species. One Planet. One Future. Rwanda, the East African country that is embracing a transition to a Green Economy, will be the global host of World Environment Day 2010. This year’s theme is ‘Many Species. One Planet. One Future. 5 januari 2010: Zo, de datum voor dit jaar is alweer bekend. 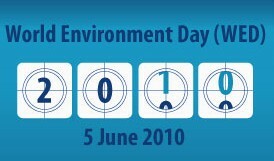 Zaterdag 5 juni 2010 is het weer World Environment Day en niemand minder dan UNEP Goodwill Ambassador Gisela Bundchen roept op om toch maar vooral mee te doen. Waaraan? Dat blijft nog even de vraag. Het thema voor dit jaar is nog niet bekend gemaakt. We houden u uiteraard op de hoogte. From Hollywood stars to schoolchildren, millions of people on every continent will take action for the planet on 5 June for World Environment Day.Under the theme ‘Many Species. One Planet. One Future’, this year’s event will celebrate the incredible diversity of life on Earth as part of the 2010 International Year of Biodiversity. This year’s global host, Rwanda – a country of exceptional biodiversity that has made huge strides on environmental protection – will lead the celebrations with three days of keynote events. Thousands of activities will also be organized worldwide from Hong Kong to Abidjan, with beach clean-ups, concerts, exhibits, film festivals, community events and much more. The 2010 global celebrations in Rwanda will involve three days of events on 3-5 June, culminating in the epic Kwita Izina gorilla-naming ceremony in the world famous Volcanoes National Park on 5 June. This year’s ceremony will be attended by 30,000 people and will involve Rwandan President Paul Kagame, Oscar-nominated actor Don Cheadle and UNEP Executive Director Achim Steiner, among other high-profile figures who will have the honour of naming the baby gorillas. 2-5 June: UNEP-Bayer youth conference: ‘African Youth Standing up for Biodiversity’ with youth from across Africa. 3 June: Conference on International Biodiversity & Conservation with Achim Steiner, Ahmed Djoghlaf, the Executive Secretary of the Convention on Biological Diversity, and Environment Ministers from around Africa. 4 June: Launch of UNEP report: ‘Dead Planet, Living Planet – Biodiversity and Ecosystem Restoration for Sustainable Development’. Kwita Izina gorilla-naming ceremony in the Volcanoes National Park. Launch of the WED Legacy Project: for every activity registered on the WED website, UNEP will donate US$10 towards gorilla conservation in Rwanda. Designation of Oscar-nominated actor Don Cheadle as UNEP Goodwill Ambassador.